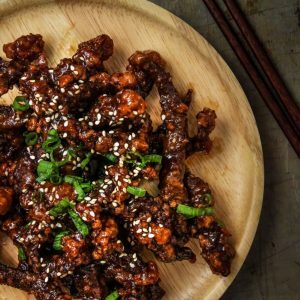 Super crispy beef tossed with a sweet and sticky sauce – better than take out! One of the most delicious ways to enjoy take out is to have it as leftovers – sometimes even cold! This recipe will not maintain the crispiness the next day BUT it won’t be soggy either! It actually has a bit of a nice chew! Make once, enjoy twice – my kinda meal. 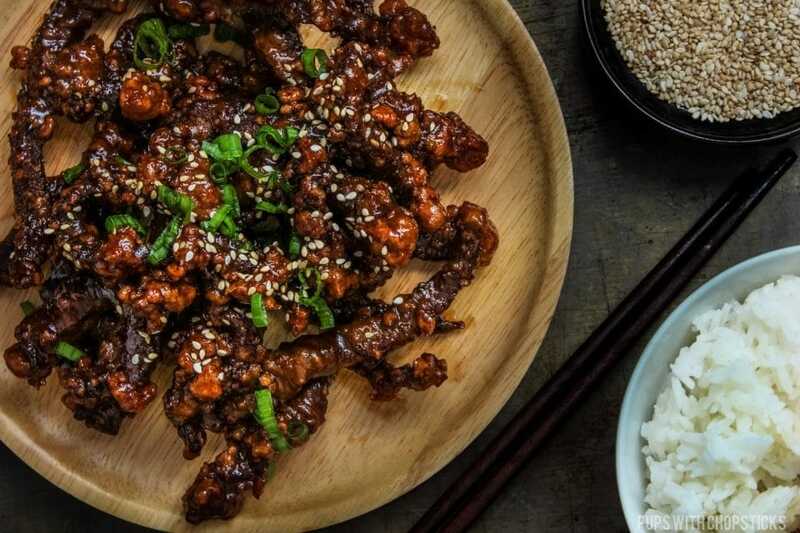 Most ingredients can be found at a local grocery store, except for hoisin sauce and shaoxing cooking wine which can be easily found at an Asian grocery store or online. 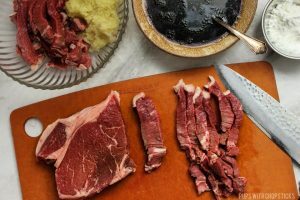 For this recipe, I usually use a top sirloin steak but this can easily be substituted with flank steak or skirt steaks as well. Here are a few things I like to do to ensure maximum flavour and texture! How you cut the beef is totally your preference in this recipe! 🙂 However, I do like to cut them into 1 cm thin strips – gives me more surface area for more crispies! Woohoo! If your steak is more than 1 cm thick, cut the strips in half length-wise again. 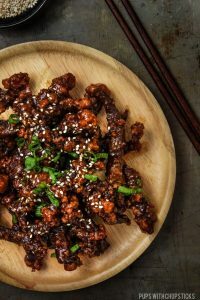 Extra Crispy Beef? Yes Please! Use a Lot of Potato Starch – There is quite a bit of potato starch in the recipe – it’s intentional! 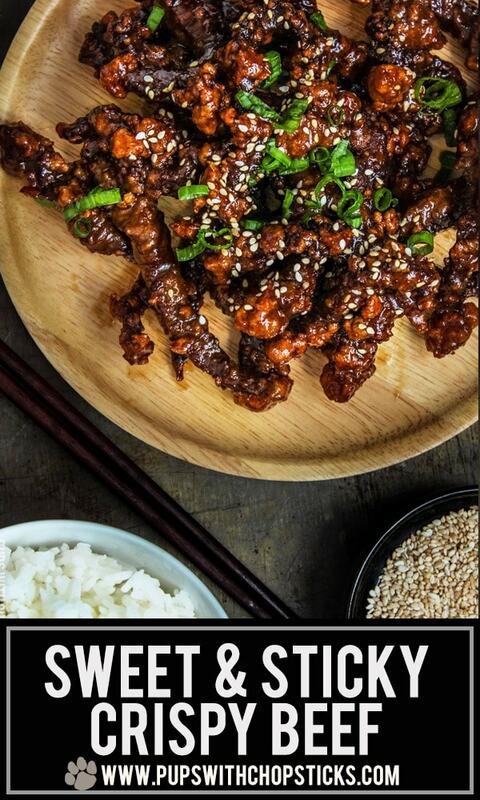 To get the beef extra crispy, you will need to coat the beef twice (after it has marinated). The first time you coat the beef with 1/2 cup of corn starch you will notice that the moisture in the beef will just sop up that starch. After 10 minutes, starch it again with the other 1/2 cup of corn starch and it should be nicely coated! Just keep in mind that the recipe is using 1.5 lbs of beef so cut back on the starch if you are using less beef. 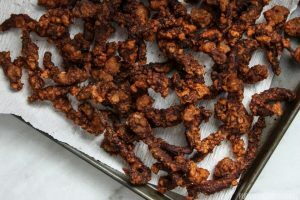 Note: After you toss the beef with starch, you might notice that the beef will clump together – not a big deal, use your fingers to separate it before frying it up. Make Sure the Oil is Hot – When you are ready to deep fry the beef, make sure the oil is hot before adding the beef in. To test if the oil is hot enough, add a small piece of beef in. It should sizzle instantly. If the oil is not hot enough the beef will end up soggy and absorb all the oil. 🙁 To maintain a consistent hot oil, cook the beef in batches so you don’t have too many things in the pan at once dropping the temperature. Double Fry All the Thingz! – Double frying does wonders to making things extra crispy. Since the beef is cut very thinly, you only need to fry it for 1 minute the first time, and another 1 minute the second time! Quick! If you need me, I’ll be here drinking the sauce. While you are waiting for the meat, heat up a heavy bottom pot (or wok) set the temperature of the oil to 375F (191C) (or medium heat) and add at least 1 inch of oil and wait for it to get hot. Once the beef has sat for 10 minutes, dust the other 1/2 cup of potato starch (or corn starch) on the beef again to lightly re-coat the beef and lightly dust off any excess starch. Deep fry it immediately. 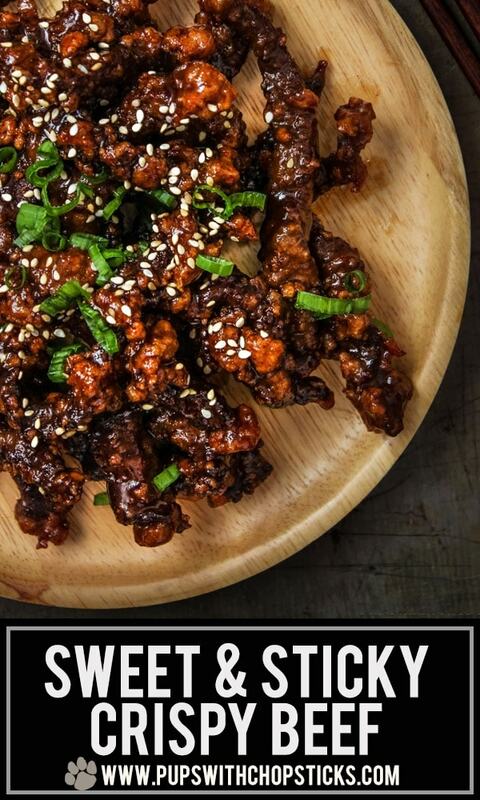 Deep fry the beef for 1-2 minutes, and remove it from the pot onto a plate with parchment paper or newspaper. Once all the beef has been cooked once (first fry), add all of it back in for the second deep fry for 1 more minute. Sweet & Sticky Sauce Time! Add in all the sauce ingredients, except the corn starch slurry ingredients. In a small bowl, combine the corn starch and cold water to make a corn starch slurry and add it into the sauce and keep stirring until the sauce has thickened. Turn off the heat. 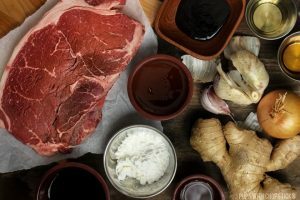 If you’re pressed for time, shorten the marinating time to 30-40 minutes by leaving the beef in room temperature for 20-30 minutes – instead of in the fridge for an hour. No low sodium soy sauce? No problem! Cut back the amount of soy sauce by a few tablespoons and replace it with water to dilute it for a lighter and less salty soy sauce. This is amazing with a bit of heat as well! Add a few chopped up peppers while you are cooking the sauce or add a few teaspoons of cayenne pepper for a bit of a kick! Very tasty. I would make it again. Only 4 stars because it feels like it’s missing something and I cant quite put my finger on it. This is my absolute fav thing to order at Chinese restaurants. I know it’s not healthy or authentic, but it’s SO good. I can’t wait to make it at home. Thanks for the recipe, Joyce! I’m happy to share! I know what you mean, it’s so hard to be healthy sometimes but it’s so good that it’s okay to treat ourselves sometimes, you know? haha 🙂 I hope you enjoy this! So happy you liked this Linda!! why do you & everywhere say to use corn starch ? That is junk to use for this dish cause it all go’s back to soggy. You need to use potato starch instead people cause it stays crispy after cooking it. I’m very happy you mentioned this. You are absolutely right. This was an older recipe that I completely forgot to update with this tidbit! Whenever I deep fry anything, I also use potato starch since it makes everything a lot crispier (like in my fried chicken recipes, sweet and sour pork etc). I am also starting to use potato starch a lot to thicken sauces as well because it creates usually creates a silkier and creamier sauce as well. I have updated the recipe with this tidbit, thanks again for being awesome and for pointing this out to me which reminded me to update this! 🙂 I left corn starch as an option in case people can’t get a hold of potato starch but left a side note that it won’t be as crispy.